Join us for the 2nd Annual D.O.E.S. 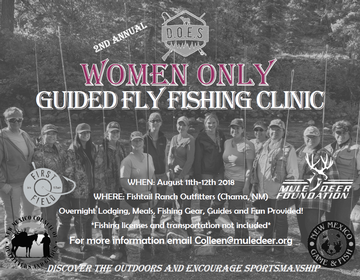 (Discovering the Outdoors and Encouraging Sportsmanship) All Ladies Fly Fishing retreat at the Fishtail Ranch in Chama, NM. This event is open to any woman with any fishing experience level. We will be learning how to cast, tie flys, water and fish ecology, and of course fly fish! All equipment, meals and lodging are provided. Participants will be responsible for their travel to and from Chama, gratuity to the guides and obtaining their New Mexico Fishing License (purchase here), Additional info about event specifics, directions and gear lists will be emailed out upon event registration.